We debated for a while on wedding favours. Edible or not? Do people really want something they can keep of the day? Probably most don't. In my experience, the memento is nice, but I have too much crap anyway, and so do I really need a favour from someone else's wedding 10 years from now? So the debate turned into, edible or useful. If it's not something you can eat, we figured at least make it something you will use. Wine Bottle stoppers? That was a possibility for a long while, but we eventually said no as surely not all of our guests drink wine, or even drink at all. 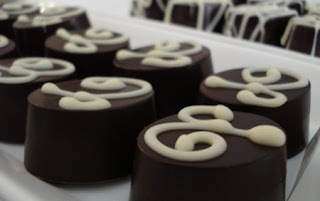 Delight - Handmade Fair Trade Organic Chocolates! Photos from their site. Hope they don't mind as I am singing their praises. Delight is an awesome little shop in the Junction. The staff are really nice and the treats are amazing. 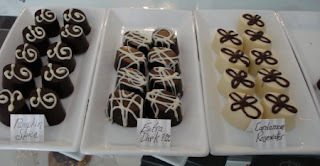 We bought most of the truffles they had available and sampled them until we picked our favourite two. Their list of flavour is quite long, it was a fairly tough decision, but we made the tasting sacrifice. They'll make them, package them, and even do the ribbon and thank you card, what service! What two flavours you ask? Well that's a secret for now, but they are awesome. I highly recommend this place to anyone looking for a chocolaty treat. UPDATE: Here's a photo of the boxed favours along with our note to guests. Also, the flavours revealed: Extra Dark Chocolate, and Masala Chai Chocolate. They're so good. Less than 5 weeks until my wedding. Between planning that, and just hanging around with my Canada-returned fiancee, I have not blogged. But, as part of the wedding, I've been looking at all of the invitation responses, and thought I would give you all a taste of the evolution process that the now-beautiful invitations went through. A family friend Pat, said she would make the cards as a wedding gift to us. She took us to an out of town craft store she knew for a little assembly/planning party to design the card. I have to say, the experience was a tad overwhelming and between us, my mom, Pat, and the store owner, I think there were too many cooks. We came up with two designs that made use of an embossed maple leaf on brown cardstock. We came home, took another look at them, and thought, "what were we thinking?" They were nice, but too dark. Also too busy for us. Finally, she didn't like the green, and it didn't match our wedding colours (not that our wedding is heavily themed to our colours, it really isn't). So my fiancee and I grabbed some supplies and she designed a few herself. This one was more pink, which she likes, and much brighter, which was good. We kept the embossed brown. Overall, decent. This was a very different style, with a jacket-like wrapping instead of a full card. I quite like it, and think it would be very good, but we decided on another we liked better. This one had three competing outside designs. A primarily brown with pink ribbon, the same with two maple leafs, and a primarily pink with brown ribbon. They each had their points, but we decided on the first, for it's colour contrast and simplicity. The inside of the card was ok, but we actually preferred the inside of the first card she designed, so we swapped it in and added some brown pockets for the reply card, map, etc.. This is what we sent off to my mom and Pat for the mass production. There were some minor modifications to get the pink ribbon the shade we wanted, the cardstock heavy enough, the card resized slightly to fit the envelopes. Here is the final result: And there you have it, wedding invitation design start to finish. My fiancee designed a beautiful card (not just my opinion; others have commented), and my mom and Pat did an amazing job recreating it 100 times. Abject apologies I just got hit on the head and recalled that I have not updated this since last month... You would not believe how terribly tardy the Victorian internet can be. But I'm sorry you'll just have to take my word for it.. I am absolutely consumed with an awfully big adventure, planning my wedding, just generally being a companion to my partner, my day is fun and exciting from dawn to I feel like going to bed. I am not complaining though. life is good. I will try to remember I promised you I will blog about it when I find my way home. Well, I'll try. Just the way life is!. Post provided by The Lazy Bloggers Post Generator.